This work is licensed under a Creative Commons License. "Ranao and Mindayen"
The future reverts back in Princess Ranao and Mindayen’s universe. So does the belief in ancient gods and goddesses which were once observed throughout the islands. Before the Muslims and the Spaniards had set foot on Philippine shores, the ancients had their sets of deities and other supernatural beings whom they fear, pray to or worship, and called on their assistance through their walks of life. The Dictionario Mithologico (Second Edition, 1895) written by Ferdinand Blummentritt, provides a list of unworldly beings respected by various natives. The Leader God was known by many names, Apu to the Igorots, Banua to the Bataks of Palawan, Kabunian and Lumawig to the tribes of Northern Luzon, Kaptan to the Visayas, Apo Malyari to the Zambal, Mananahahut to the Kiangans and Magnisda to the Tagbanuas. But the leader god was popularly known by his Sanskrit name as Bathala or Bathalang Maykapal. Makakoret: who created the sky. The goddess Lalahon was believed to reside in a remote volcano called Malaspina, located somewhere in the islands of Negros. Sida-pa, another island goddess, was believed to reside on the top of a legendary mountain called Madya-as somewhere in the island of Panay. Legends tell about Sida-pa and her own tree of life. She was said to make notches on the tree that said to regulate the life time of all people. In agricultural areas, the natives prayed to the gods for good harvest and to protect the fields. For the Tagalogs, Idianale was the god of agriculture and Lakanpati was the protector of their fields. On the other hand, the Zambals call upon Dumagan and Damolag, before planting thewir crops to protect their fields from storms and typhoons. The Bagobos tribe calls on Dimakolem, god of the mountains for their well being. Taguibanua was the agriculture god in some areas in Mindanao while in the Visayas, she was also a goddess for house hold benefactors. Sedumunadok was the god of their planting fields. In the Tagalog fishing villages, they call upon Aman Sinaya for aid. On the other hand, Poko, was the Tagbanua people’s sea god. In the story of Ranao and Mindayen, the prevalent sea goddess is Abyang Ghinbinitan. There are also fighting and warrior gods that said to boost moral among different combatants. The tribes of Pangasinan had Apolaki as their war deity. The Visayan people once offered sacrifices to Wataugo for victory in battle. Deities of welfare also played important roles in ancient Filipino lifestyle. Ang them were Lakambini of the Tagalogs who was said to be giver of food and Lakambakad as healer of sickness. The goddess of love among the Tagalogs was Dian Masalanta. There were evil gods, said to live in hell-like places for the damned. The Tagbanuas had Basaud as their hell-like abode, while the Ilocanos had Kasamaan. The Visayan people called the god of hell, Sumpoy (Siguinaguran or Suinuran) who was aided by his demon armies called Yawa or Panulay. The gods and goddesses who resides on Eden-like places were the ones worshipped and often called by the natives for help and blessings. Kadungan was the paradise-like site for some tribes in Northern Luzon. The Bicolanos called such a place as Kamburagan. The Visayans call their paradise as Ologan. Now Playing: A young mermaid warrior named Mindayen. A young Mermaid named Mindayen. 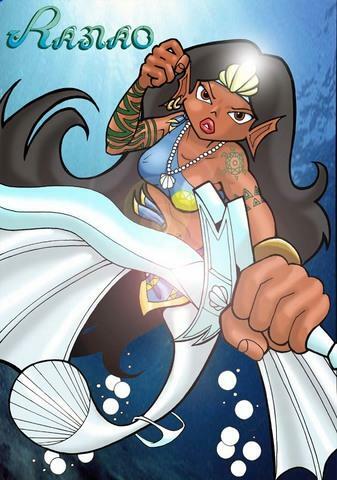 The creation of “Ranao” leads to the development of yet, another mermaid heroine. 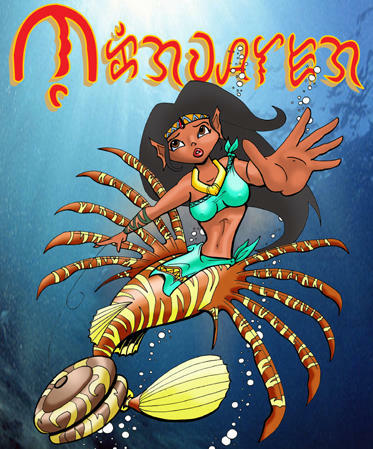 This time, the story centers not to a princess, but around a young and resolute, mermaid warrior who lived at the nearby island of “Lakawon”, a neighbor island of Pearl Island of Ranao. Just like Princess Ranao, Mindayen‘s characterization is a combination of headstrong female characters who answers the call of challenge. Again, there is Hayao Miyazaki’s Nausicaa of the valley of the Wind; Princess Urduja of ancient Philippine legends, then Ariel of Disney’s The Little Mermaid. Ranao and Mindayen seem identical at first glance. They were both on their early teens, of mermaid warrior blood; both can sprout legs and fins at will; both had thick black hair, gorgeous dark skin, native tropical features and aquatic ears. Both their stories are set in the same period and same archipelago. But they have different destinies to full fill. Ranao’s theme is self maturity; her impulsive attitude leads to her kingdom’s ruin. It was her self analyzing had brought her to her own redemption. Correcting her disposition, means the recovery of her kingdom and it's deliverance from evil. On the other hand, Mindayen’s story deals with an intruding foreign belief that grows and shatters the culture and heritage of the villages that it touches. This foreign religion brought war and strife among the islanders and it’s up to her to stop it. But before she could stop this, she have to convince her people (Both human and ethereals) to return to worship the indigenous gods that once held them together in harmony. Characters and Native epics that influenced the character of Princess Ranao. Now Playing: Characters and Native epics that influenced the character of Princess Ranao. The creation of Princess Ranao starts from the concoction of several fictional characters. Hayao Miyasaki's Nausicaa of the valley of the wind was one of them. Nausicaa's head strong personality was a model for Ranao's character. The other one is Princess Urduja. An ancient Philippine legend from Pangasinan, Urduja was aprincess said to challenge her suitors in a fight before she can have them for a date. Then there is that charming mermaid princess, Ariel of Disney's The Little Mermaid. Stories of epics, done in poetry displayed tremendous vitality, color and imagination. Tales of love and adventures about native heroes, endowed with powers from the gods, battle monsters, and triumphs over formidable armies, rode the wind, traveled in flying shields and protect the earliest communities of the islands. Established epic poems of notable quality and length blossomed. And early historians like Padre Colin, Joaquin Martinez de Zuniga and Antonio Pigafetta have all attested to the existence of these epics. There were even reports of a dramatic play given by natives at the arrival of Don Miguel Lopez de Legaspi in 1565. Epic poems and songs about the exploits of enchanted folk heroes were performed during festivities and proper occasions. Most often, these epic poems (folk epics or ethno-epics) were titled after the names of the hero involved, except for some which carry traditional titles like the Kalinga Ullalim; the Sulod Hinilawod; the Maranao Daragen; or the Bicol Ibalon. Stories about folk heroes of long ago were described as “Old Time History” because; they can be used to study the lifestyle and beliefs of the people who produced them. They were also referred to as “Lost”, because they were soon forgotten by natives influenced heavily by Spanish and “western” colonization. But there are those who perpetuated myths that in the early days of Spanish intrusion, priests in their zealous rage against paganism destroyed all existing records, as well as all forms of writing and art works, regarding ancient Philippine folk heroes. This is a blatant Christian crime against a rich and noble culture! There was even a Spanish priest who arrogantly boasted of destroying more than 300 scrolls written in native characters. But this is not true. The colorful and fascinating literature of pre-Hispanic Filipinos are still here. Giving the new generation, an over view of a heritage that is an unusual and invaluable source of joy and information. Regarding the life style, love and aspirations of early Filipinos. It is from these, wonderful epics, where a Filipino can find his or her national identity. Now Playing: A new, mermaid heroine! I remember the time, when we used to live in Negros, we had this spectacular 75 gallon ?Reef Tank? filled with live corals, scallops, crabs and other ?inverts? picked up from a nearby beach. Unlike other beaches frequented by both local and foreign tourists, this beach seemed undisturbed. Its sandy shores and tide pools remained untouched. My brother and I used to inspect tide pool boulders for colorful sponges, sea anemones, star fishes, limpets, shells and other tiny marine creatures, clinging onto rocks. In the aquarist?s lingo, what were doing is called ?dipnetting? or collecting species from the wild. For me, the ocean offers more than just collecting tiny sea life for aquarium captivity, it rouse a world of imaginations. A universe of mythical beings, shaded as the creatures from its depths. Just like those who were fascinated by vampires, witches, werewolves, dwarves, elves and other ethereal organisms, I am enthralled by the beauty and enigma of mermaids. Once perceived by sailors and mariners from encountering dugongs and manatees, mermaids are half women, half sea beasts that inspire both fear and fascination. Tales were made regarding these mythical creatures. There were tales that appeal to children. There were stories created as foundations for forbidden love. There were stories made to scare readers and there were stories made as mere vessels for physical fantasies. But I noticed, most of the mermaid tales that I?ve seen seem to focus on the male character?s corporeal and charismatic charms and not so much on the physical beauty and mysterious attributes of the mermaid character. Let?s take Disney?s The Little Mermaid as an example. After rescuing a shipwrecked prince, the mermaid character expressed vocally how beautiful the prince was. But as the movie progress, there was no hint for this prince to express what he sees on our mermaid heroine, verbally. Another mermaid story, titled Dyesabel had its ?prince? in the character played by Richard Gomez. The movie?s mermaid character (played by Alice Dixon) was awes trucked by the male character as he unintentionally displays his physic before the admiring mermaid (And at the viewers.) There was even a write up that the whole Dyesabel movie was tailor made for Richard Gomez. If so, then they should have made a merman movie starring Richard Gomez in the first place. Then here comes a more recent mermaid T.V. drama, Marina. The main mermaid character in the show was played by Claudine Barretto. The show does not only put the mermaid beauty in the back seat, it also had close up shots of male underwear crotches. I could only shake my head in dismay in relation to these shows. And it compels me to wonder: ?Can any body make a mermaid story with the mermaid character?s charm and beauty as its main focus?? My frequent beach combings with my brother stirred my imaginations. The salty ocean breeze, swaying palm trees, the sound of surf as it touch the sandy shores, all integrated to form a new universe. A cosmos filled with native imageries, towering coconut trees, exotic orchids, white sandy beaches, wondrous islands, volcanic canyons, green fields and Blue Mountains, indigo seas, deadly weapons, gorgeous native girls and heroic warriors. A sphere, where humans and mythical beasts live and co-exists. Here, a young, beautiful mermaid princess struggles to save her father and her people from the clutches of a growing evil and confront her father?s deadly secret. The world of, Princess Ranao.